This article is about the Russian political party. For the high school with the Kadet mascot, see Air Academy High School. For other parties with the same name, see Constitutional Democratic Party (disambiguation). For the current Russian party, see Party of Popular Freedom (current). The Constitutional Democratic Party (Russian: Конституционно-демократическая партия, Konstitutsionno-Demokraticheskaya Partiya, K-D), also called Constitutional Democrats and formally the Party of People's Freedom, was a liberal political party in the Russian Empire encompassing constitutional monarchists and moderate republicans. Party members were called Kadets (or Cadets) from the abbreviation K-D of the party name. Konstantin Kavelin's and Boris Chicherin's writings formed the theoretical basis of the party's platform. Historian Pavel Miliukov was the party's leader throughout its existence. The Kadets' base of support were intellectuals and professionals while university professors and lawyers were particularly prominent within the party. A large number of Kadet party members were veterans of the zemstvo, local councils. The Constitutional Democratic Party formed from the merger of several liberal groupings, namely the Union of Liberation, the Union of Zemstvo Constitutionalists and the Union of Unions as well as the organization of bourgeois professionals and intellectuals, including teachers, lawyers, writers, physicians and engineers. The Kadets' liberal economic program favored the workers' right to an eight-hour day and the right to take strike action. The Kadets "were unwaveringly committed to full citizenship for all of Russia's minorities" and supported Jewish emancipation. The party drew significant support from Jews and Volga Germans and a significant number of each group were active party members. The Constitutional Democratic Party was formed in Moscow on 12–18 October 1905 at the height of the Russian Revolution of 1905 when Tsar Nicholas II was forced to sign the October Manifesto granting basic civil liberties. The Kadets were to the immediate left of the Octobrists, another new formed party organized at the same time. Unlike the Octobrists, who were committed to constitutional monarchy from the start, the Kadets were at first ambiguous on the subject, demanding universal suffrage (even women's suffrage) and a Constituent Assembly that would determine the country's form of government. This radicalism was despite the fact 60% of Kadets were nobles. The Kadets were one of the parties invited by the reform-minded Prime Minister Sergei Witte to join his cabinet in October–November 1905, but the negotiations broke down over the Kadets' radical demands and Witte's refusal to drop notorious reactionaries like Petr Nikolayevich Durnovo from the cabinet. With some socialist and revolutionary parties boycotting the election to the First Duma in February 1906, the Kadets received 37% of the urban vote and won over 30% of the seats in the Duma. They interpreted their electoral win as a mandate and allied with the left-leaning peasant Trudovik faction, forming a majority in the Duma. When their declaration of legislative intent was rejected by the government at the start of the parliamentary session in April, they adopted a radical oppositionist line, denouncing the government at every opportunity. On 9 July, the government announced that the Duma was dysfunctional and dissolved it. In response, 120 Kadet and 80 Trudovik and Social Democrat deputies went to Vyborg (then a part of the autonomous Grand Duchy of Finland and thus beyond the reach of Russian police) and responded with the Vyborg Manifesto (or the "Vyborg Appeal"), written by Miliukov. In the manifesto, they called for passive resistance, non-payment of taxes and draft avoidance. The appeal failed to have an effect on the population at large and proved both ineffective and counterproductive, leading to a ban on its authors, including the entire Kadet leadership, participation in future Dumas. This was further accentuated by the force of the tsar trying to control and deteriorate the power of the Duma. It was not until later in 1906, with the revolution in retreat, that the Kadets abandoned revolutionary and republican aspirations and declared their support for a constitutional monarchy. The government remained suspicious of the Kadets until the fall of the monarchy in 1917. Finnish liberal politician and professor of jurisdiction and politology Leo Mechelin was expelled 1903–1904 when the Kadets were preparing to form a party. Mechelin cooperated with them and wrote them a liberal constitution for Russia to be enforced when they would get into power. At the time of Vyborg Manifesto, Mechelin was already the leader of the Finnish government, or "Mechelin's senate" (1905–1908), which implemented the universal right to vote and freedoms of expression, press, congregation and association. When the Second Duma was convened on 20 February 1907, the Kadets found themselves in a difficult position. Their leadership was not represented in the Duma after the Vyborg Manifesto fiasco and their numbers were reduced to about 100. Although still the largest faction in the Duma, they no longer dominated the parliament and their attempts to concentrate on lawmaking were frustrated by radicals on the left and on the right who saw the Duma as a propaganda tool. Although the Kadets had moderated their position in the Second Duma, they refused to vote in May 1907 for a resolution denouncing revolutionary violence which gave the government of Pyotr Stolypin a pretext to dissolve the Second Duma on 3 June 1907 and change the electoral law to drastically limit the representation of leftist and liberal parties. Due to the changes in the electoral law, the Kadets were reduced to a relatively small (54 seats) opposition group in the Third Duma (1907–1912). Although excluded from the more important Duma committees, the Kadets were not entirely powerless and could determine the outcome of certain votes when allied with the centrist Octobrist faction against right-wing nationalist deputies. With the revolution crushed by 1908, they moderated their position even further as they voted to denounce revolutionary violence, no longer sought confrontation with the government and concentrated on influencing legislation whenever possible. By 1909, Miliukov could claim that the Kadets were now "the opposition of His Majesty, not opposition to His Majesty", which caused only moderate dissent among the left-leaning faction of the party. 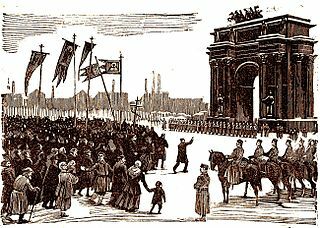 Although the Kadets, allied with the Progressive faction and the Octobrists, were able to push some liberal bills (religious freedoms, freedom of the press and of the labor unions) through the Duma, the bills were either diluted by the upper house of the parliament or vetoed by the tsar. The failure of their legislative program further discredited the Kadets' strategy of peaceful change through gradual reform. In 1910, the government rekindled its pre-revolutionary Russification campaign in an attempt to restrict minority rights, notably drastically curtailing Finland's autonomy. Most Kadets were opposed to these policies and allied with the left-wing of the Octobrists tried to blunt them as much as possible, but they were unsuccessful. However, a minority of Kadets headed by Pyotr Struve supported a moderate version of Russification, which threatened to split the party. With the increase in popular discontent after the Lena massacre on 4 April 1912 and a continuous decline in party membership after 1906, the rift in the party became more pronounced. Kadet leaders on the left like Central Committee member Nikolai Vissarionovich Nekrasov argued that the Duma experience had been a failure and that "constructive work" was pointless under an autocratic government. Kadet leaders on the right like Central Committee members Vasily Maklakov, Mikhail Chelnokov, Nikolai Gredeskul and Ariadna Tyrkova-Williams argued for a shift to the right. The disagreements were temporarily put aside in July 1914 at the outbreak of World War I when the Kadets unconditionally supported the government and found an outlet for their energies in various kinds of relief work under the umbrella of the All-Russian Union of Zemstvos and the All-Russian Union of Cities. Once the initial outburst of national unity feelings died down in mid-1915 as Russian retreat from Galicia showed the government's incompetence, the Kadets, together with the Progressive faction, the Octobrist faction and a part of the Nationalist faction in the Duma, formed the Progressive Bloc in August 1915 which was critical of the government's prosecution of the war and demanded a government of "popular confidence". As Russia's defeats in the war multiplied, the Kadets' opposition became more pronounced, culminating in Miliukov's speech in the Duma in October 1916 when he all but accused government ministers of treason. During the February Revolution of 1917, Kadet deputies in the Duma and other prominent Kadets formed the core of the newly formed Russian Provisional Government with five portfolios. Although exercising limited power in a situation known as dual power, the Provisional Government immediately attempted to deal with issues of the many nationalities in the Russian Empire. They introduced legislation abolishing all limitations based on religion and nationality and introduced an element of self-determination by transferring power from governors-general to local representatives. They issued a decree recognising Polish autonomy, more as a symbolic gesture in light of the German occupation of this territory. However, this tendency was limited as most of the ministers feared a break up of the empire. One of the Kadet leaders, Prince Lvov, became Prime Minister and Miliukov became Russia's Foreign Minister. A radical party just 11 years earlier, after the February Revolution the Kadets occupied the rightmost end of the political spectrum since all monarchist parties had been dissolved and the Kadets were the only openly functioning non-socialist party remaining. The Kadets' position in the Provisional Government was compromised when Miliukov's promise to the Entente allies to continue the war (18 April) was made public on 26 April 26. The resulting government crisis led to Miliukov's resignation and a powersharing agreement with moderate socialist parties on 4–5 May. The Kadets' position was further eroded during the July crisis when they resigned from the government in protest against concessions to the Ukrainian independence movement. The coalition was reformed later in July under Alexander Kerensky and survived yet another government crisis in early September. Sergei Fedorovich Oldenburg was Minister of Education and served briefly as chair of the short-lived Commission on Nationality Affairs. The Kadets had become a liability for their socialist coalition partners and an evidence of the treason of the moderated socialists, exposed by Bolshevik propaganda. With the Bolshevik seizure of power on 25–26 October and subsequent transfer of political power to the soviets, Kadet and other anti-Bolshevik newspapers were closed down and the party was suppressed by the new regime. Oldenburg and a group of academics visited Vladimir Lenin at the Smolny Institute to complain about the arrest of several former ministers of the Provisional Government. By the summer of 1917, many prominent Kadets were supporters of Lavr Kornilov during the Kornilov affair. After the Bolshevik victory in the Russian Civil War, most of the Kadet leadership was forced to emigrate and continued publishing newspapers abroad (mainly in Paris) until World War II. However, Oldenburg negotiated a working relationship between the Russian Academy of Science and the Bolsheviks, signing an agreement that the Academy supported the Soviet State in February 1918. A party called Constitutional Democratic Party – Party of Popular Freedom was founded in the then-Russian SFSR in 1990 and based on the program of the historical Kadet party. However, the party soon drifted into hardline nationalist politics and joined the national-communist National Salvation Front and supported the Supreme Soviet against President Yeltsin. ^ Struve, Peter (1932). The Social Liberalism. Internationales Handwtsrterbuch des Gewerkschaftswesens. pp. 412–423. ^ Maksimov, Konstantin Nikolaevich (2008). Kalmykia in Russia's Past and Present National Policies and Administrative System. Central European University Press. pp. 172–173. ^ Pearson, Raymond (1977). The Russian Moderates and the Crisis of Tsarism 1914 – 1917. Springer. p. 2–3. ^ This name should not be confused with the term cadets, which referred to students at military schools in the Imperial Russia. ^ Hans Rogger, Jewish Policies and Right-wing Politics in Imperial Russia, p. 20. ^ The Zemstvo in Russia: An Experiment in Local Self-government (eds. Terence Emmons & Wayne S. Vucinich), p. 441. ^ Melissa Kirschke Stockdale, Paul Miliukov and the Quest for a Liberal Russia, 1880-1918, p. 142. ^ James W. Long, From Privileged to Dispossessed: The Volga Germans, 1860-1917, p. 207. ^ Peter Gatrell, Government, Industry and Rearmament in Russia, 1900-1914: The Last Argument of Tsarism, p. 81. ^ Stephen Kotkin, Stalin (Vol. 1: Paradoxes of Power, 1878-1928), Penguin Books, 2014, p. 187. Melissa Stockdale. "The Constitutional Democratic Party" in Russia Under the Last Tsar, edited by Geifman, Anna, Blackwell Publishers Ltd, 1999, ISBN 1-55786-995-2, pp. 164–169. Mari National Rebirth Party "Ushem"
People's Freedom Party "For Russia without Lawlessness and Corruption"
Nikolai Vissarionovich Nekrasov was a Russian liberal politician and the last Governor-General of Finland. Pavel Nikolayevich Milyukov was a Russian historian and liberal politician. Milyukov was the founder, leader, and the most prominent member of the Constitutional Democratic party. In the Russian Provisional Government, he served as Foreign Minister, working to prevent Russia's exit from the First World War. Mikhail Vladimirovich Rodzianko was a Russian statesman of Ukrainian origin. Known for his colorful language and conservative politics, he was the State Councillor and chamberlain of the Imperial family, Chairman of the State Duma and one of the leaders of the February Revolution of 1917, during which headed the Provisional Committee of the State Duma. He was a key figure in the events that led to the abdication of Nicholas II of Russia on 15 March 1917. Leopold (Leo) Henrik Stanislaus Mechelin was a Finnish professor, statesman, senator, liberal reformer and businessman. A leading defender of the autonomy of the Grand Duchy of Finland, and of the rights of women and minorities, Mechelin's 1905–1908 government ("Mechelin's Senate") made Finland the first nation in the world with the universal right to vote and to be elected. During his period in office the freedom of expression, the press, and of assembly were introduced. Alexander Ivanovich Guchkov was a Russian politician, Chairman of the Third Duma and Minister of War in the Russian Provisional Government. Vasily Alekseyevich Maklakov was a Russian trial lawyer and liberal parliamentary orator, one of the leaders of the Constitutional Democratic Party and Russian Freemasonry, notable for his advocacy of a constitutional Russian state. His brother Nikolay Maklakov served as Russia's Interior Minister from 16 December 1912 – 5 June 1915. Progressive Bloc was an alliance of political forces in the Russian Empire and occupied 236 of the 442 seats in the Imperial Duma. Dmitry Nikolaevich Shipov was a Russian liberal Slavophile politician of the 19th and 20th century. The Russian Provisional Government was a provisional government of Russia established immediately following the abdication of Tsar Nicholas II of the Russian Empire on 2 March [15 March, New Style] 1917. The intention of the provisional government was the organization of elections to the Russian Constituent Assembly and its convention. The provisional government lasted approximately eight months, and ceased to exist when the Bolsheviks gained power after the October Revolution in October [November, N.S.] 1917. According to Harold Whitmore Williams the history of eight months during which Russia was ruled by the Provisional Government was the history of the steady and systematic disorganisation of the army. Fyodor Fyodorovich Kokoshkin was a Russian lawyer and politician, author of seminal works on jurisprudence, the First Russian State Duma deputy, and a founding member of the Russuan Constitutional Democratic Party and the Controller general of the Russian Provisional Government. The playwright Fyodor Kokoshkin was his grandfather.